A heavy duty lip balm is an absolute must-have at this time of year. As the weather gets colder, my lips always get drier so I've been on the hunt for something to keep them properly hydrated. 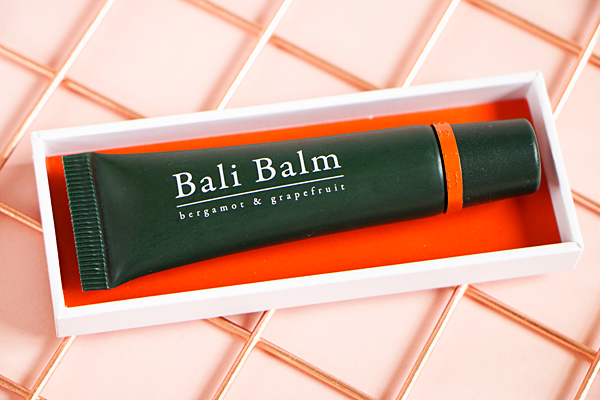 My latest & greatest discovery is Bali Balm, a luxury unisex lip balm. The rich, intensive formula is 100% natural, vegan & cruelty-free. Each lip balm contains active botanicals that are high in antioxidants & boast antibacterial properties. Most importantly, they make your lips feel incredible! 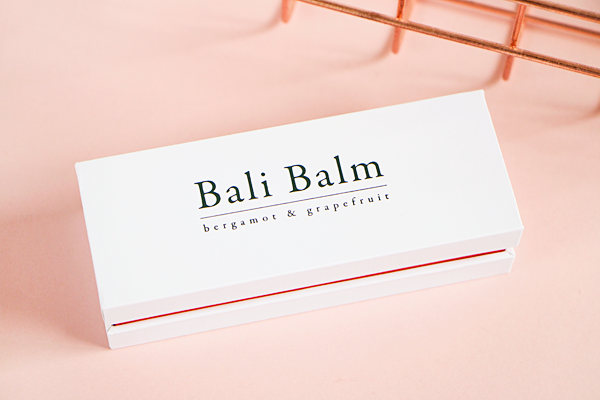 Bali Balm is currently available in four different flavours: Bergamot & Grapefruit, Cinnamon & Burnt Orange, Lemon & Black Pepper and Sandalwood & Ginger. 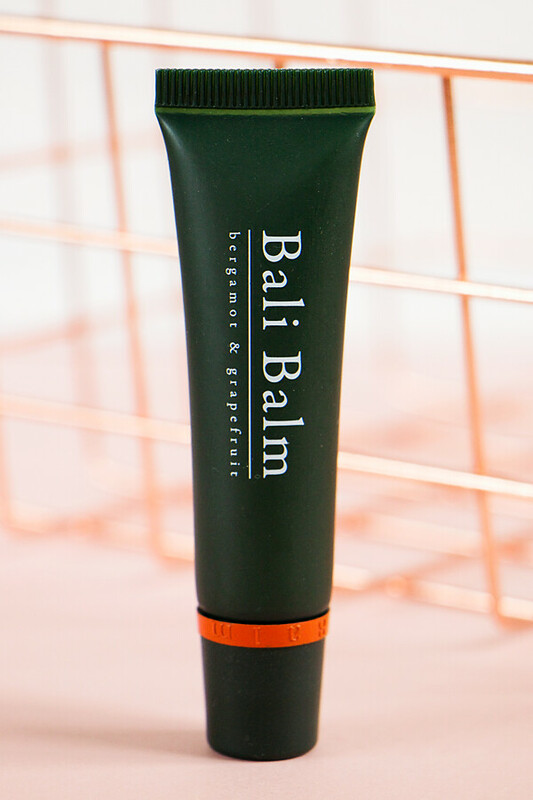 To create each flavour Bali Balm collaborated with Russell Batemen, a London chef well known for his fresh, innovative cuisine. I decided to go for the Bergamot & Grapefruit lip balm as I love citrus flavours and I'm obsessed with Earl Grey tea which is heavily flavoured with bergamot oil. The balm is strongly scented & has the most wonderful citrusy aroma. Even though I obviously know what bergamot & grapefruit taste like, I was pleasantly surprised by the flavour of this lip balm. I expected something quite mild & sweet but it's actually pretty powerful & somewhat masculine. Bergamot oil is known to have both calming & uplifting effects, while the grapefruit acts as a purifying agent. It also features peppermint leaf oil & rosemary extract. Combined, these ingredients give the lip balm a clean, fresh & fruity taste that really packs a punch! Some of the best lip balms on the market use beeswax, honey or lanolin as a base. However Bali Balm are a vegan brand so they don't use any ingredients that are tested on or produced by animals. Instead the lip balms are created from ingredients that are readily replenished without harming the environment. The Bergamot & Grapefruit lip balm contains coconut oil, castor seed oil, kukui nut oil & candelilla wax. Blended together, these ingredients create the most luxurious moisturising balm that almost melts into the lips. It's so comfortable to wear & doesn't feel greasy or sticky at all. The smooth semi-matte finish will appeal to all genders. A little goes a long way with this product and it instantly makes my lips feel more supple & hydrated. For a lip balm, the staying power is really impressive. This stuff stays on my lips for hours, shielding them from the elements & treating them overnight. It's one of the best cures for dry, chapped lips & it also makes a fantastic base for matte lipstick. The lip balm comes packaged in this bespoke moulded gift box. The bold white & orange packaging feels expensive & high quality. 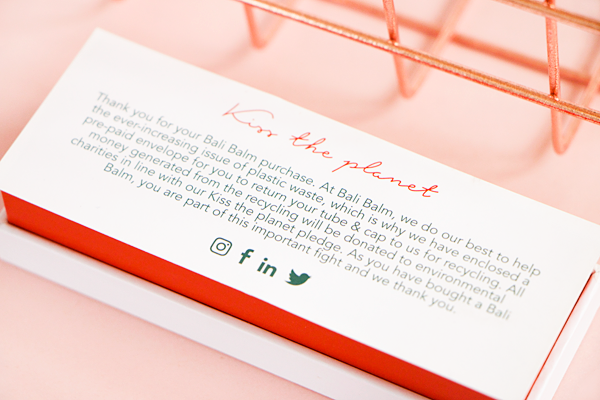 The box is fully recyclable as Bali Balm are very passionate about looking after the environment but it's kind of thing you'd probably want to keep as storage for little bits & bobs. The product inside is wrapped in delicate tissue paper that matches the gift box. It all looks extremely classy & high end. It's the kind of thing you'd be thrilled to receive as a gift or a stocking filler. 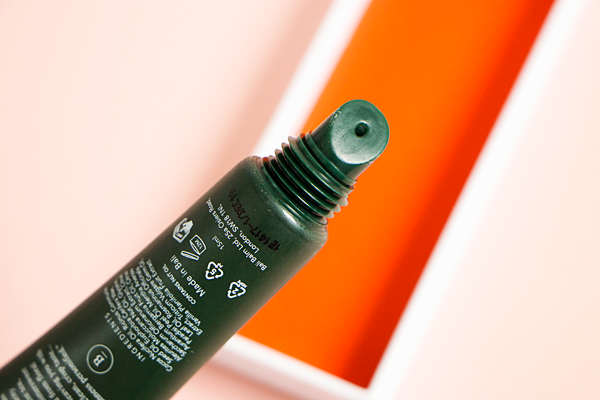 The lip balm comes in this green squeezy tube with a slanted applicator that really hugs your lips. The tube has a simple, elegant design that easily slips into your handbag. For £20 you get 15ml of product which might seem expensive but everything about this item screams luxury. There aren't many luxury brands that are so environmentally friendly or willing to donate to charitable causes so in my mind that makes these lip balms worth every penny. One of the things I really like about Bali Balm as a company is that they seem much more environmentally minded than other brands. They created the 'Kiss The Planet Pledge' as a way to support eco-friendly, sustainable & cruelty-free practices in the production, packaging & use of their lip balm. Bali Balm really go out of their way to make sure that when you buy their product you're also contributing to organisations that are doing their part to make the world a better place. They even include a pre-paid envelope with every order so that you can send your empty lip balm tubes back to Bali Balm for recycling. 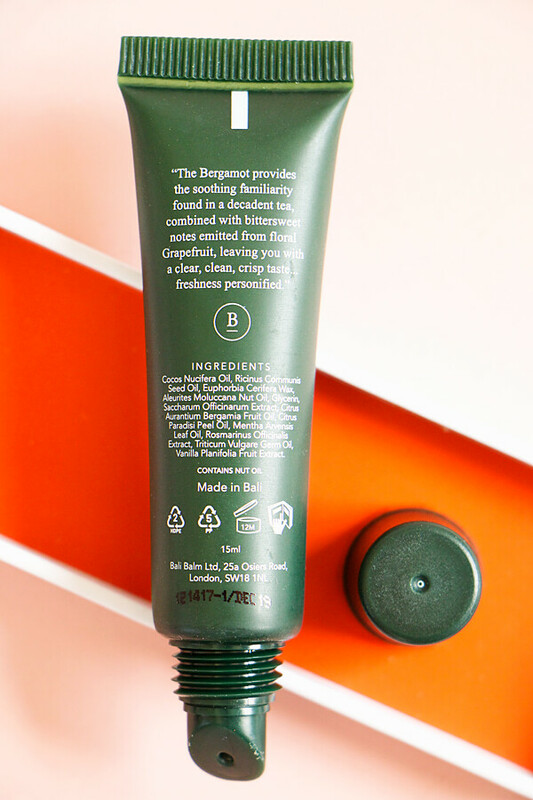 I only hope that more beauty brands start up similar recycling initiatives to help reduce plastic waste as this is such an important environmental issue that affects us all.